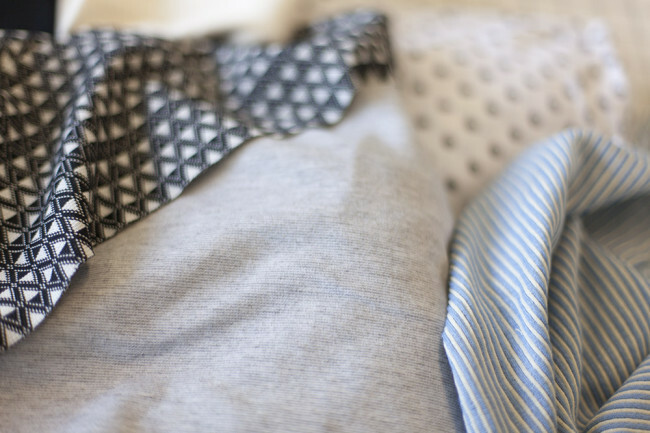 If you’re new to sewing with knits, there are a few things you need to know. Whether or not you have a serger, you can make knits work for you with a few simple techniques and supplies. Generally, seam allowances on patterns designed for knits are smaller than what you might be used to. That’s because most domestic overlock machines (also known as sergers) are designed to sew at 3/8″ instead of 5/8″. Whether or not you’re using a serger, keep in mind that the seam allowance will be a bit smaller. For this pattern, it should be sewn at 3/8″. A ballpoint needle is designed to separate the yarns of fabric as it stitches, instead of piercing through them. This is ideal for knit fabrics, because it means the needle is less likely to create runs. Ballpoint needles are sometimes also labeled “jersey needles”. It’s extremely important that the type of stitch you use for your knit garment can stretch. Knit fabrics have stretch. If you have a line of stitching that does not stretch much and you try to stretch the fabric, the stitches will pop and break. Imagine pulling on a swimsuit with stitching that doesn’t stretch. You can almost hear the sound of stitches breaking in your head, can’t you? Luckily, you can create stretchy stitches either with or without a serger. 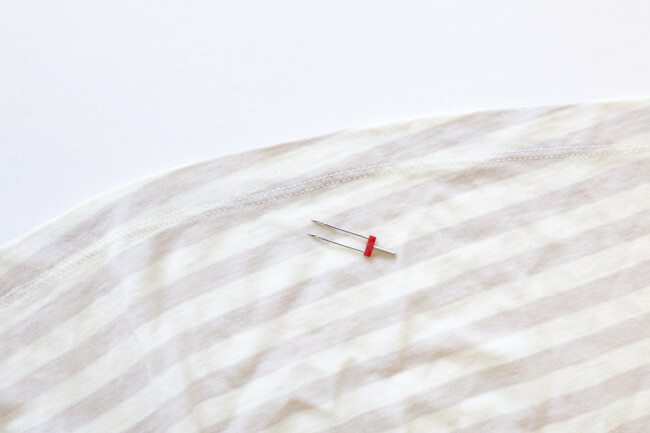 With a serger (also called an overlock machine), use the overlock stitch to join your seams. This is a wonderful piece of equipment for knits because the stitching stretches and finishes the edges all at the same time. If you don’t have a serger, you can sew seams with a narrow zigzag. Set the length of the stitch to 2.5mm and the width to 0.5mm. The zigzag will provide enough stretch for your knit fabric. Unlike the serger, the zigzag stitch doesn’t provide the neat and tidy finish on the raw edge. 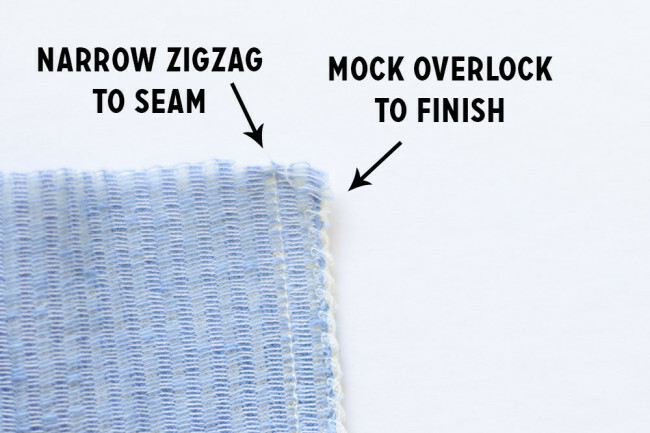 If you’d like to finish the raw edge, you can zigzag again along the raw edge, or use a specialty stitch on your sewing machine such as the mock overlock stitch. 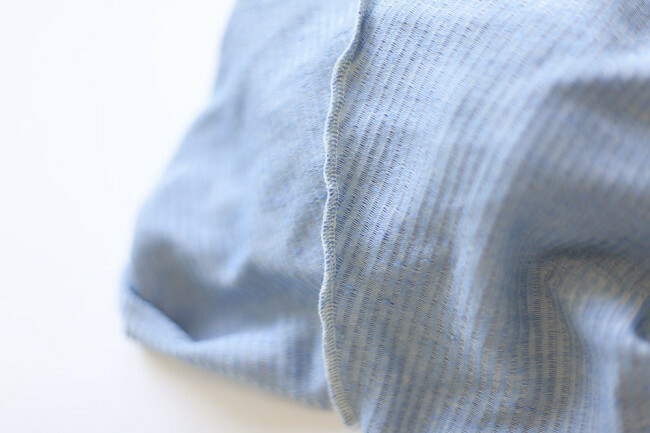 For more details on the variety of stitches you can use on your standard sewing machine with knits, check out The Colette Guide to Sewing Knits. In it, we provide a really handy stitch chart for even more options! In commercial factories where most clothing is made, knits are hemmed with a special machine called a coverstitch. You can buy a coverstitch machine for home use, but most of us don’t have access to one at home unless we sew with knits quite a lot. Luckily, there are other techniques you can use! 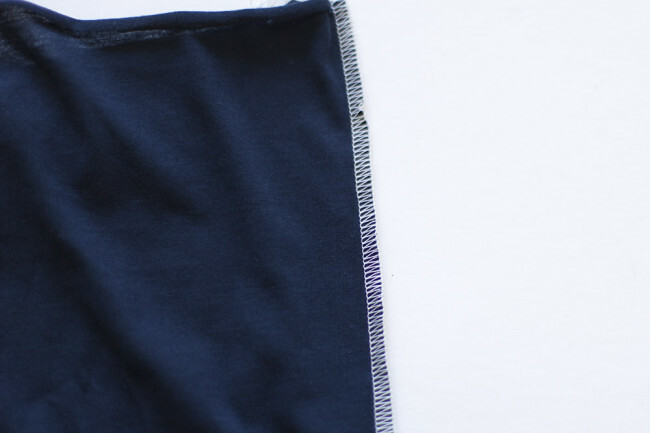 Many alternatives are covered in The Colette Guide to Sewing Knits, but the most common method uses a standard home sewing machine and a twin needle. For more information on how to hem with a twin needle, see this post on The Coletterie on hemming with a twin needle. 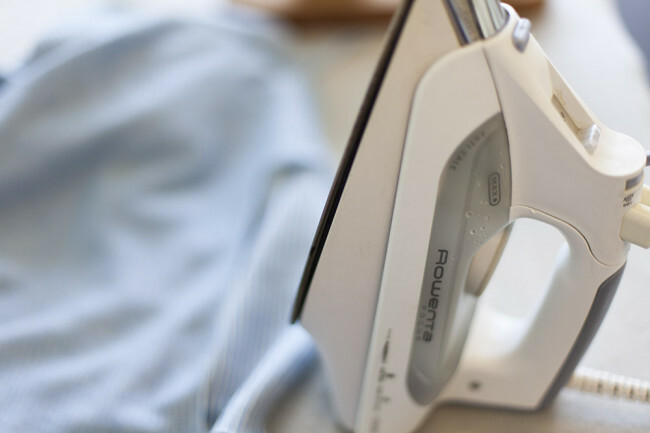 If you’re used to sewing with woven fabrics, you probably spend a lot of quality time with your iron. One of the reasons knits are so fast to sew is that there is much less pressing to do. There’s no need to press every seam after it’s sewn, and in fact too much pressing can distort the fabric. As we sew, we’ll let you know if there is any pressing that should be done. Otherwise, you can leave the iron off and just give the finished garment a nice steam when you’re done. That’s it! I highly recommend checking out The Colette Guide to Sewing Knits for even more alternative techniques you can use with knit fabric. It’s really fun to experiment with different edge finishes and stitches. Tune in again on June 2 and we’ll start with cutting our fabric! 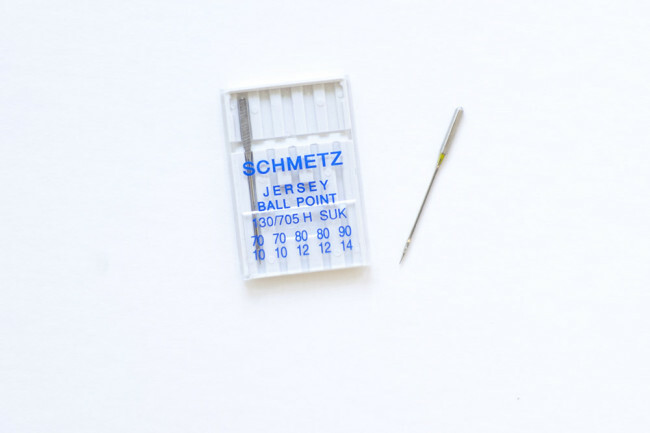 If we are using a serger do we need the ball point needles for the serger? I try to use ballpoint needles on my serger, especially when sewing finer knits. If you think about it, the needles on the serger are basically doing the same thing that they are doing on the standard sewing machine, so it makes sense to use the same type of needles. It does depend a bit on the fabric. A dense, thick knit like ponte is much less prone to running, so a universal needle will not be likely to damage your fabric. But with finer knits, I definitely use a ballpoint. My first sew-along….this is so much fun! Thank you. I am so excited to get started on this. My first ever knit project! To wash the cotton knit before sewing, Or Not to wash the cotton knit before sewing..This is my question! I recommend washing your fabric however you plan to clean the final garment. Sarai, I am a little confused about what stitch to use with my serger. I am not very familiar with my serger–I only know how to thread it one way and it’s what I have been using for every single project! So I thought I should be brave and try something new, but I don’t know which stitch to try! I am thinking maybe for my machine the stitches have a different name. Would you be able to tell me what needles/loopers are used for the overlock stitch you use? I was reading through my manual and there are a couple of different overlock stitches (three-thread overlock, two-thread over edge, two-thread wrapped edge overlock) though thee don’t mention that they reinforce the seam as you serge. There is one stitch recommended for stretching the seam as in swimwear (three-thread ultra-stretch mock safety stitch) and I am wondering if that’s the one I am looking for. Any thoughts and guidance will be very appreciated!! Thanks for this sewalong, I am so excited to get sewing! Hi Ledys. Does your machine hold four cones of thread? If so, the stitch you want is a 4-thread overlock. A 3-thread overlock is similar, but usually slightly smaller and a little less secure. It’s great for things like undies and swimwear. For most serging, you will use the 4-thread overlock. The mock safety (or regular safety) is best for heavy woven fabrics, like denim. As the “safety” name implies, it adds extra security, but is a little more bulky. If you really want a good rundown of the serger, I highly recommend Alyson’s book! It’s got clear info about the stitches and what they’re used for. Can I use my 3 thread overlocker or will I be better using my sewing machine. It really depends on your fabric and how secure you need the stitches to be! I’d say, test sew a seam with your fabric of choice, then tug on and stretch the seam in all directions to test it out.